After two rounds of voting, the “unification council” chose a primate for the new Ukrainian nationalist church from among the ranks of the schismatic “Kiev Patriarchate” (KP) hierarchs. 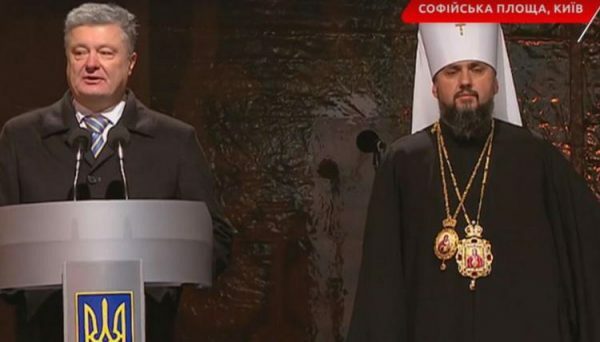 The election of “Metropolitan” Epiphany Dumenko as the new primate was announced by Ukrainian President Petro Poroshenko on the square outside the St. Sophia Church where the “council” is being held. The newly-elected was introduced as “Metropolitan of Kiev and All Ukraine,” reports the Union of Orthodox Journalists. According to BBC Ukraine, Met. Simeon of Vinnitsa, who went into schism today by his participation in the Council according to His Eminence Archbishop Clement of Nizhyn and Prilutsk, the head of the Ukrainian Church’s Information Department, lost the primacy by 20 votes. Epiphany was the “Deputy Patriarch” of the KP and is a close protégé of Philaret Denisenko who is the main architect of the nationalist-schismatic movement in Ukraine. Meanwhile, as Epiphany announced, is considered the honorary spiritual father for life of the new church, reports Interfax-Religion. Poroshenko has several times repeated the lie that the canonical Ukrainian Church prays for the Russian government and army. His Eminence Metropolitan Jonathan (Yeletskikh) of Tulchyn and Bratslav has offered to send Poroshenko a Priest’s Service Book for him to find such prayers, but the President has only responded by doubling-down in the deception. According to a previous statement from the Speaker of the KP, Evstraty Zorya, Met. Epiphany will travel to Istanbul to receive the tomos of autocephaly from Patriarch Bartholomew on January 6.